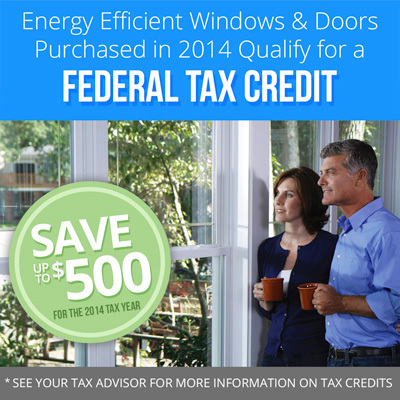 Are you aware that you may be eligible for a tax break if you installed new windows or doors in 2014? Last month President Obama signed into law the Tax Increase Prevention Act of 2014 (HR 5571). The bill covers a number of situations that would allow citizens to receive a tax break from 2014 expenses, but one in particular stands out for the home improvement industry. The credit will cover 10 percent of the product’s cost, up to $500, and only applies to purchases made in 2014. Congress did not extend the law into 2015 purchases, or purchases made before 2014. While the bill does reward customers who are helping conserve energy with energy-efficient windows and doors, customers should be aware that there are limitations that may exclude labor costs and other non-qualifying expenses. But, all limitations considered, some tax credit is better than nothing. So, if you purchased energy-efficient windows or doors from Window World in 2014, you may be eligible for a tax write-off. We are happy to help answer any questions you may have about the bill, or you may read the full bill here. And, if you haven’t yet installed energy-efficient windows in your home, there is still good incentive to do so! Though you may not receive a tax break, you will receive the money-saving benefits that energy efficient windows offer on their own. Contact us today to learn more!